In an unprecedented move, the Jharkhand government has put four persons, accused of being associated with "illegal" trade union activity, Ajay Hembrum, Mohan Murmu, Daya Chand Hembrum and Damodar Turi, all of them undertrials, under solitary confinement, allowing them to mingle with other prisoners only twice a day for two hours. Arrested and put in Giridih Central Jail after the crackdown on the Mazdoor Sangathan Samiti (MSS), a registered trade union, banned on December 22, the relatives of these prisoners have complained that the cells in which these undertrials have been kept are unclean and without any basic facilities. Worse, according to the relatives, they are prevented from giving basic items like mosquito repellents, food and clothes to the four inmates, with the number of persons who can visit and the frequency of visits having been "arbitrarily curtailed." Bringing this to light, a civil rights organization, Persecuted Prisoners’ Solidarity Committee (PPSC), led by veteran human rights activist Stan Swamy and trade union leader and lawyer Sudha Bhardwaj, have said that that Turi is not even a member of MSS. In an email alert, PPSC has said, "These and other undertrial prisoners have been put in solitary confinement since March 23, 2018", adding, "In response, prisoners went on a hunger strike on March 27." According to PPSC, following the hunger strike, "under pressure, since April 2 the jail administration allowed these prisoners to mingle with other prisoners only twice a day for two hours", calling the solitary confinement a "violation of the constitutional and statutory rights of prisoners as guaranteed by the law of the land." According to PPSC, "It is unconstitutional and illegal to keep undertrial prisoners under solitary confinement in India. Solitary confinement is envisaged only for convicts (s.73, 74 IPC) and that too on compliance of strict statutory conditions." "Further", PPSC says, "it is only under an order of a Court that such confinement can be authorised (Sunil Batra v Delhi Administration, 1978 AIR 1675)", adding, "Internationally, solitary confinement is recognised as a form of torture." Notably, India is a signatory to the Convention against Torture and Other Cruel, Inhuman or Degrading Treatment or Punishment, 1987. MSS was declared an unlawful association under section 16 of the CLA Act, 1908, accused of being a “frontal organisation of the CPI (Maoist)." 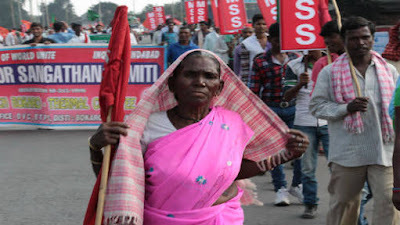 It has been working for the rights of doli mazdoor and other workers since 1989 in Giridih, Bokaro, Dhanbad, Hazaribagh, Ranchi, Ramgarh, Gaya, Kharsawan and Jhalda districts of Jharkhand. Claiming to have membership of around 22,000 workers, MSS, says the PPSC email alert, has "exposed the fake encounter killing of one of their members Motilal Baske in June 2017, and has been protesting against the amendments to the land laws (Chotanagpur Tenancy Act 1908 and Santhal Pargana Act 1949) aimed at dispossessing Adivasis and Moolvasis of their land." Says PPSC, "As part of the ongoing repression, the government has also banned another organisation Popular Front of India (PFI) in February leading to 3 FIRs, arrests of its members and sealing of their offices", adding, "PFI has been involved in exposing the role of administration and cow-vigilante groups in lynchings of Muslims and intimidation of their families." Meanwhile, PPSC has demanded that the ban on MSS and PFI be revoked,cases against members of MSS and PFI be withdrawn, and persons incarcerated be released immediately.